We knew Mom meant business. With a family of six, space was limited. The green station wagon with its wood paneling was stuffed with boxes of food, suitcases, and red plaid sleeping bags. The family was going to the lake. The ride to the lake was no more than an hour or two, but to me it felt like forever. I’d sit in between my brothers. While my younger sister, Lori-Ann got to sit up front, the lucky one. For most of the trip, I’d ward off snakebites, Charlie horses, the repeat game, and of course, the disgusting spit bubble. My brothers, John and Joe had mastered this feat to perfection. I’d sit frozen as John held the bubble just inside his lips and teased me by inching closer and closer. “AAAHHH,” I screamed, John’s drool almost touching my cheek. “Do you want your Dad to stop this car?” Mom turned around and yelled. The three of us shook our heads. A stopped car meant sore bums. We sat stiff while Mom’s evil eyes scanned our faces, looking for any hint of a smirk that showed our disrespect. Satisfied, with the straight faces, I watched relieved as Mom turned around and smiled sweetly at Dad. It was those times I really wondered if Mom was related to Mr. Hyde, she had a keen ability to change from sweet to psycho in a matter of seconds. A rare disease I thought, and worried that I might inherit it. Forced to listen to Mom belt out all the songs on her Patsy Cline tape, I watched amused as John and Joe pretended to hang themselves with make-believe ropes, while they lip-synched to the songs. My gut ached from laughing, as they tried to mouth the words, often resorting to “Watermelon, watermelon” when they didn’t know them. By the time we reached the lake, we all knew, whether they wanted to or not, the lyrics to the entire cassette. “Bring in your sleeping bags,” Mom said. A suitcase in each hand, she headed into the cabin. After we’d thrown our sleeping bags onto our beds, we all filed into the kitchen and stood in a line at attention. In no way were they the Von Trapp family, much to Mom’s disappointment. But when Mom spoke, we listened. The kitchen erupted into chaos. The boys tossed boxes of Kraft dinner, like they were missiles, and Lori-Ann and I were under attack. A can of beans, flew back and forth between John and Joe, a game of hot potato ensued. I watched horrified when Joe reached for the hotdogs and threw them at John. Then John picked up a bag of marshmallows to throw back at Joe. The game got scarier by the minute as they tossed the three items back and forth. Lori-Ann and I started to inch further and further away form them not wanting any part of their game… when food crashed to the floor. Everybody dropped whatever was in their hands and tiptoed to the door, covering their bums… just in case. “Mission accomplished,” the boys whispered giving each other the thumbs up. In our quest to flee, we switched to a game of Cowboys and Indians, running in between trees and shooting make-believe arrows and bullets. The Indians, my brothers, captured me and tied me to a tree. “Let me go,” I yelled. My small feet kicked, as I tried to make contact with one of their shins. “Yes they do,” I shouted back as tears streamed down my freckled face. “John Wayne never cried,” Joe said thoughtfully. His arrow, a stick he found on the ground, rested on his chin. “I’m not John Wayne,” I argued. I hated when they bullied me. “Well, if you’re not John Wayne,” John held the arrow, a stick as well, from his bow an inch from my nose and gave me a menacing stare. “Then, who are you?” His black hair glistened in the light, a seagull feather stuck in it. “Uh… I’m…” I stuttered. “I’m that girl who shoots everybody up.” My wrists sore from the too-tight rope. “What girl?’ John asked, the arrow now pointed at my heart. “You know the one in Dad’s favorite western movie… that girl.” I lied. “There isn’t any girl that shoots everybody up in Dad’s movies.” Joe scoffed. I wasn’t about to give in, I needed to get free, or I’d be tied to the tree all day. “Yes there is!” I glared at them. “Please let me go,” I pleaded with them, as I tried not to cry. But they ignored me and continued to weave, sway, hop on one leg and lift their arms high above their heads while they danced. “Maybe we can make it rain?” Joe’s face lit up at the prospect and they shouted louder. Their arms jerked up and down violently. This got their attention, and soon I was set free. But, like a glutton for punishment I retaliated with a kick to Joe’s shins, but before I could run away, Joe yelled, “Snake pit. Look out!” They pushed me to the ground and pinched my arms. The game was over. I looked like a leopard with bright red spots. “I’m telling,” I cried and they scattered. The sun had slowly disappeared behind the trees and I had avoided my brothers for most of the day, the red welts still visible on my skinny arms still hurt to touch them. Huddled around the campfire I had just gotten warm, when Joe dumped a whole glass of ice down my back. Cold and frigid, I bolted up like a rocket, and began to jump up and down, my brother’s laughter echoed throughout the campground. Mad and annoyed I had gotten the last of the ice out of my shirt and sat down in my lawn chair only to leap back up again. They had left three pinecones on my seat, to pinch my bottom. “Grrrrr.” I stomped my foot frustrated. 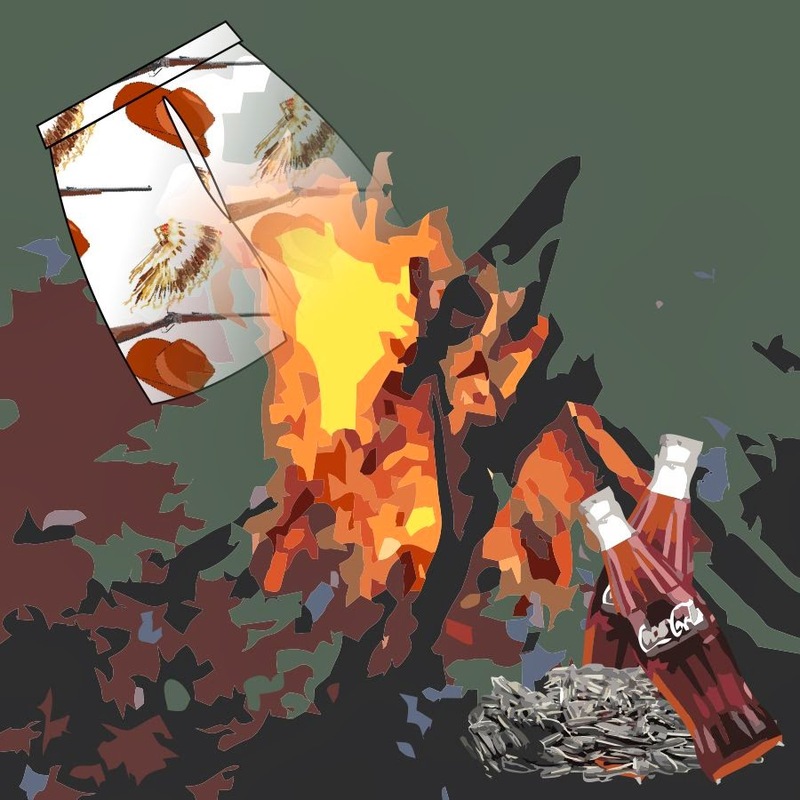 An hour later I was still nestled around the campfire and watched through blurry eyes, as John and Joe walked over to their lawn chairs, carrying Cokes and big bags of sunflower seeds in their hands. Each took a huge handful of the seeds and popped them into their mouths, sucking the salt from them. John stood up first, his face red, then Joe. They looked at each other and turned to spit the tiny black seeds out all over the ground. “My mouth,” John screeched, as his fingers raked his tongue. Joe jumped from foot to foot. “Hot, hot, hot.” He coughed, gagged and spit again. Then both took off towards the cabin for water. My blue blanket wrapped tightly around me, I snuggled deep inside my lawn chair. “Nothing beats Tabasco sauce,” I snickered. Author note* These events happened every summer until I was 13, or until my brothers out grew their childish behavior, I’m not sure which happened first. "It was those times I really wondered if Mom was related to Mr. Hyde, she had a keen ability to change from sweet to psycho in a matter of seconds. A rare disease I thought, and worried that I might inherit it." I can relate to this. My mother could do it and I used to do it with my kids when they were smaller. If she was like me, she wasn't really angry just putting on her game face for disciplinary reasons. Instead of threatening to pull over - which my father would never do even if one of us was desperately in need of a washroom - Mum would threaten to have Dad turn the car around and go home. In retrospect, this was also an empty threat. Sure, Dad would probably do it, but Mum was the one who really wanted to get away.